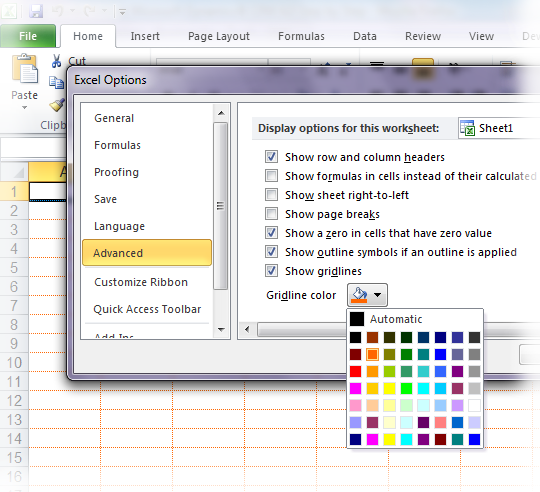 Go to the 'File' tab on the ribbon, and choose 'Excel Options'. In the window that comes up, you're going to want to click the 'Advanced' option from the menu on the left side. On the right side, scroll down until you get to the 'Display options for this worksheet' area. Click the paint bucket icon next to 'Gridline color' and you'll be able to choose a new colour for your gridlines. See the screenshot below for an example - I've made my gridlines orange. "Which worksheets does this affect?" By following these steps, you're only changing the colour of the gridlines in the worksheet you currently have open. It will not change the gridlines in any other tabs, nor will it change the colour for new spreadsheets that you create in the future. "Can I do this in Excel 2007?" Yes, it's pretty much the same process except you'll find 'Excel Options' under that round office button instead of the 'File' tab. "This is silly, why would I ever want to do this?" Some people want higher or lower contrast when it comes to the gridlines, or they just want to make their spreadsheet a little more visually appealing. I have found myself changing the colour of my gridlines if I happen to be working a lot with borders that are grey and I need to really be able to distinguish between borders and gridlines. There are lots of great features in Microsoft's latest release of PowerPoint, but there's one little one that I really think was a clever idea: a built-in laser pointer. That's right, my friends! As your presentation is running, what you need to do is hold down the Ctrl button on your keyboard and then left-click and drag around the screen and you'll notice your cursor has changed into a glowing dot that you can use to point out whatever you'd like on the slide. It's just like a laser pointer, without having to worry about the batteries dying! Don't like the colour? No problem. You can choose between red, green, and blue by going to the 'Slide Show' tab on the ribbon and choosing 'Set Up Slide Show'. Choose from the drop-down under 'Show Options' where it says 'Laser pointer color'.